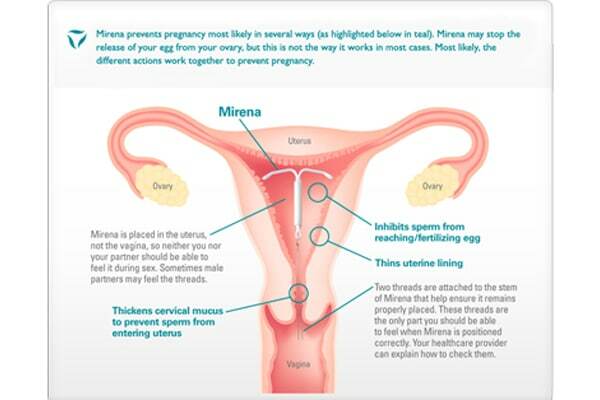 A.Mirena is a very small, soft, flexible plastic T-shaped device designed for insertion into the uterus (womb). The device is in fact smaller than a matchstick. The packaging includes the applicator for doctor’s use. Q.What are the benefits of Mirena? A.Mirena is very effective reversible contraception. It is at least as effective as female sterilization. It also results in significant reduction in menstrual bleeding in most women (90%). Over 95% reduction in bleeding by 12 months. Hormonal effects such as weight gain are far less likely with Mirena. Q.How long does it last for? A.It is effective for up to 5 years when it can be easily replaced. GPs can remove. A.Mirena has a very small amount of hormone (progestogen), which is released slowly and locally into the uterus over 5 years. This thins out the lining of the womb (endometrium) and affects sperm function and movement. A.Mirena is inserted in a fashion similar to having a pap smear in the Doctor’s rooms, while awake, and will take up to 5 minutes. Q.What if I have my period? A.This is absolutely fine. It is best inserted within 7 days of starting a period (whenever possible) especially if you haven’t had a vaginal birth before. A.Very brief discomfort is common during insertion, followed by period-like pain for a few hours. Dizziness is uncommon. It is generally very well tolerated. Q.Do I need to be fasting or take the day off? A.Fasting is not required. Taking the day off is entirely optional. Q.What if I’ve never had kids? A.Mirena does not affect your future fertility. There is about a 1 in 10 chance that you will need to have it inserted under general anaesthetic if you haven’t had a vaginal birth before. Fertility returns immediately on removing Mirena. Q.How soon does it start working as contraception? A.Mirena is effective immediately if inserted within 7 days of starting a period. Q.Is it normal to have slight bleeding and spotting after Mirena insertion? A.It is common to continue to have slight bleeding and then some spotting up to 3 to 4 months after insertion for heavy periods. You should report severe pain.